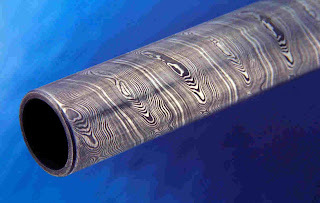 As we noted in our previous post, wootz steel (the steel used in the so-called "damascus blades") was NOT used to make damascus barrels very much. William Greener in his Gunnery in 1858: Being a Treatise on Rifles, Cannon and Sporting Arms writes that these barrels are rare and on examination of the available barrels made by wootz steel workers, most were actually were made of commonest iron with a very thin plate of wootz steel around them, indicating that the wootz steel ore was becoming very valuable, since the mine in India where the ore came from was running out. 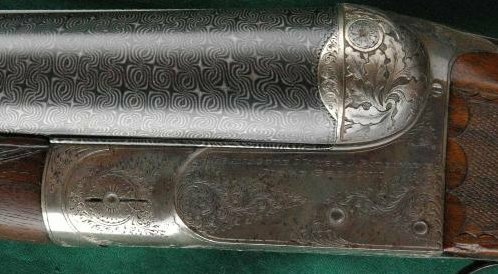 Instead of using wootz steel, the more common option was to use pattern welded steel and the reason that they were called damascus barrels is because the patterns on the pattern welded steel resembled that made from wootz steel. So the name "damascus" is a misnomer and when we say "damascus barrels", we really mean "pattern welded barrels". In pattern welding, two or more metals are used to make the barrel (usually iron and steel bars, or steel bars of varying carbon content). 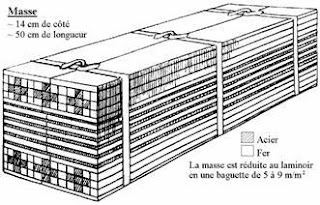 To study how this was done, first we start with the invention of the Puddling Furnace to prepare iron and steel bars of required carbon content. Pig iron from quality iron ore is placed in a furnace, melted and cleaned of all impurities by puddling. The impurities are generally lighter than the molten iron and hence rise to the top and can be skimmed off. Any carbon generally burns off as carbon-dioxide and bubbles out of the molten iron. When most of the impurities have been skimmed off, the iron is allowed to cool and form large balls (called blooms) about 30-38 cm. in diameter and weighing about 35-40 kg. Each ball is then grabbed with a pair of tongs and put under a tilt hammer and manipulated to make it a square shaped block. This process is called shingling, and it condenses the iron atoms (increases its density) and makes additional impurities and brittle scale fly off during the hammering process. It is then passed between several rollers, which elongate the bar and thin out its cross-section. The rolling process also increases the ductility of the iron bar. This process ends up losing approximately 40% of the material that we started with, but produces high quality iron suitable for making gun barrels. Scrap steel is also treated the same way as the iron bars, but if new steel bars are used instead, then those low in carbon content are chosen and used directly without going through the puddling process. Steel is not improved by the puddling process like iron is. The dark parts are steel and the light parts are iron in the above figure. In other cases, instead of using bars that are square and rectangular in cross-section, they may use rhomboidal cross-section bars, or hexagonal cross section bars etc. The pattern that is produced on the barrel at the end depends on how the bars are arranged in the stack. The above image shows how they are arranged to produce a star pattern, but there are different ways to stack the bars to produce other pattern shapes as well, some of which were only known to old-time barrel makers and are now lost. The stack is arranged with more steel than iron to produce stronger barrels. The bars are then heated and welded together into a single bar and then, it is rolled between various sets of heavy rollers to produce a longer bar. For instance, we may have 25 bars of steel and iron each 60 cm. long, 5 cm. wide and 0.6 cm. thick (or 23.5 x 1.96 x 0.23 inches). After welding and rolling, we may have a long bar which is 1 cm. square (or 0.393 inches square) in cross-section. This long bar is then cut into 120-150 cm. (48-60 inches) lengths to make it more manageable. These bars are then heated again to red-heat about 45-60 cm. (18-24 inches) at a time and one end is put into a fixed square hole or a vice grip and the other end is put into a movable square hole or tongs and then twisted. During the twisting process, the rod is watched very carefully to make sure it twists evenly. If one side twists more than the other, a skilled worker with a pair of tongs holds that side to prevent it from twisting and evens it out. The process of heating and twisting is repeated until the whole bar is twisted evenly and this produces a uniform pattern. After the whole bar is twisted, it will have a circular cross-section, except for the two ends held by the square holes or vice grip/tongs which will still be square. The bar will also reduce in length due to twisting. For example, a 120 cm. (48 inches) long rod before twisting will become about 100 cm. (40 inches) long after twisting and have about 32 turns per every 10 cm. (4 inches) length. 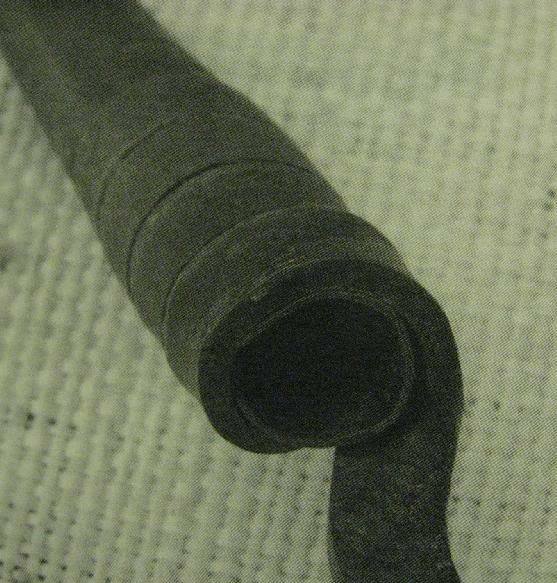 The two square ends of the rod are cut off and the rod may be used to manufacture a barrel. Depending on the quality of the barrel desired, a single twisted rod may be used, or multiple rods may be used. For instance, in cheapest damascus barrels, only a single rod is used and this is heated and flattened into a ribbon. In better quality barrels, two, three, four, six or eight rods may be used. If multiple rods are used, they are chosen so that adjacent rods are twisted left or right. The rods are then combined together and welded together and rolled into a single long ribbon. Usually, very fine patterns are obtained by using three rods, so using more rods is generally considered overkill. The diagram below shows how to combine three rods into a single long ribbon. Note how the rods are placed so that adjacent rods twist in opposite directions. The rods are flattened into a long ribbon of a given uniform thickness. The coil is then heated and the spirals welded together by hammering. Generally three people are involved in this operation -- a skilled foreman who holds and rotates the coil with one hand on a grooved anvil and also has a small hammer on the other hand to indicate where to strike. The other two workmen carry heavier hammers and strike at the points indicated by the foreman. This forms the tube of the barrel. The hammering process is continued until the barrel cools down enough that it turns black in color, which finishes the process. This hammering improves the density and tenacity of the barrel and the wear and tear of the barrel greatly depends on performing this process properly. If polygonal barrels (such as octagonal) are desired, then the same process may be performed by using an appropriately shaped anvil. If longer gun barrels are needed, then two or three ribbons of different thicknesses may be used. The thickest ribbon is used to form the part of the barrel that forms the breech and the thinnest ribbon is used to form the part of the barrel that is the muzzle of the gun (since the pressure of gases at the muzzle is lower than at the breech, the barrel can be thinner at the muzzle end). The ribbons are combined end-to-end to form a long ribbon and then it is hammered into the spiral form as described in the last two paragraphs. Notice the intricate patterning on the barrel. The evenness of the pattern has to do with the quality of welding the iron and steel bars together and how evenly the twisting of the rods was done. This is clearly the work of very skilled craftsmen. In the previous post, we'd mentioned that pattern welded barrels were being made in India since the mid 1500s. The technology gradually went west, reaching Turkey around the 1600s and then Hungary (1634), Spain (1650), Austria (in 1683), Belgium (1700), France (1750s) and eventually reaching England in the late 1700s/early 1800s. W.W. Greener, in his book, The Gun and its Development, Second Edition, mentions that pattern welded gun barrels were made in England between 1800 and 1910 or so. Around that time, the main centers of pattern welded barrel production were Birmingham and London in England; La Chafontaine, Liege and Nessonvaux in Belgium; St. Etienne in France; Vienna in Austria; Suhl in Prussia (Germany) and Brescia in Northern Italy. He also mentions that some makers in the European continent, especially in Belgium, produced some of the most beautifully figured barrels, but they were not as strong as English barrels, because they were more concerned about the pattern than the strength, whereas English manufacturers tended to put more priority on strength of the barrel and put pretty figuration lower down in importance. Some Belgian manufacturers would use up to 32 plates of iron and steel to make a single rod which would be twisted into a very fine screw thread. Six of these twisted rods would be used to make a single ribbon and the pattern on these ribbons were very fine lines, no thicker than the point on a needle. His father, William Greener, in his treatise about the Gun, mentions that while such barrels were very beautiful to look at, too much twisting is bad for iron, since it rearranges the iron fibers which normally run parallel to each other and support each other. Nevertheless, the manufacture of Damascus barrels in Belgium was cheaper than in England and by the 1850s, some English manufacturers (especially in London) were importing some of their barrels from Belgium. By 1910 or so, pattern welded barrels were not made in England any more and all English manufacturers imported their "damascus" barrels from reputable Belgian sources. The popularity of pattern welded barrels started to wane because of stronger steel barrels produced by other methods (such as Whitworth steel) and the fact that making fine pattern welded barrels was labor-intensive and needed high skill of craftsmanship. By the start of WW-I, when Germany invaded Belgium, production of pattern welded barrels had ceased completely. Note that while pattern welding did produce stronger barrels in the 1700s and part of the 1800s, the rise of better steel production techniques made this technology somewhat obsolete. Despite popular culture which assumes that pattern welded Japanese samurai swords can cut through anything, the truth is that even a modern spring from a car suspension has better quality steel than an authentic pattern welded Japanese sword from the 1700s/1800s. The same holds true for gun-barrels as well and modern steels far exceed pattern welded steel in hardness, toughness and durability. The extra labor and specialized skills needed to make pattern welded steel barrels also made it less desirable compared to other techniques. Production of pattern welded barrels was restarted in the 1960s in England and gradually other countries began to produce them in small quantities. They are still made by specialized makers for custom beautiful shotguns and pistols.